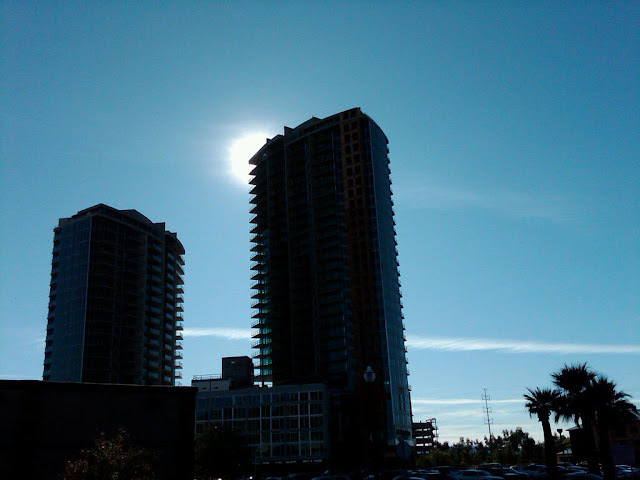 see "Tempe Centerpoint towers in foreclosure" by Dianna M. Nanez Contributed by Catherine Reagor in the Arizona Republic on January 11, 2010. 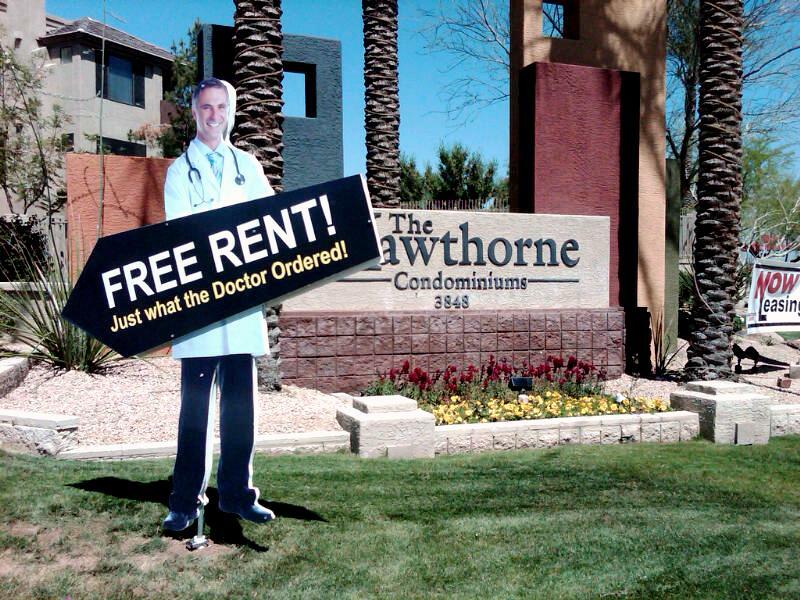 This is not a review of this particular Central Phoenix apartment complex of 1,2 and 3 bedroom apartments but rather a commentary on the progression of the dizziness of the height of the real estate boom and condo-conversions from 2004 to the realization of the depth today in Phoenix. Essentially this is a rather typical story of an apartment complex built in 1996 that 10 years later got caught up in the tail end of a condo-conversion craze driven by investors. Two bedroom, 1040-square-foot "condos" in this location were being sold for $230,000 in 2006. Currently they are being offered for sale between $52,000 - $70,000 and the the rental price of that same two bedroom unit unit today is $1040 per month. 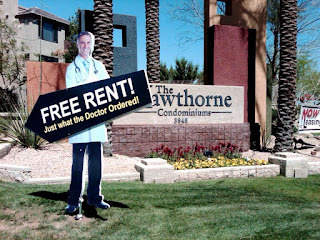 As can be seen in the photographs there are also "Free Rent" enticements since they have a low occupancy rate. It is not clear what "Just what the Doctor Ordered!" means on the sign, except they do happen to be located within a mile of a major hospital, neurological center, surgical centers and large medical office buildings. The ratings reviews online currently range from "I am a little UNHAPPY with this business" to "Staff is HOT and Great." There are also complaints about insect infestation and the maintenance but to be fair and balanced it's also "...nice and well-maintained community." Truthfully, the comments lean more towards "stay away" than the almost manufactured sounding positive ratings. The real point is this particular property is one example of a location Phoenix is literally littered with of similar complexes and situations. 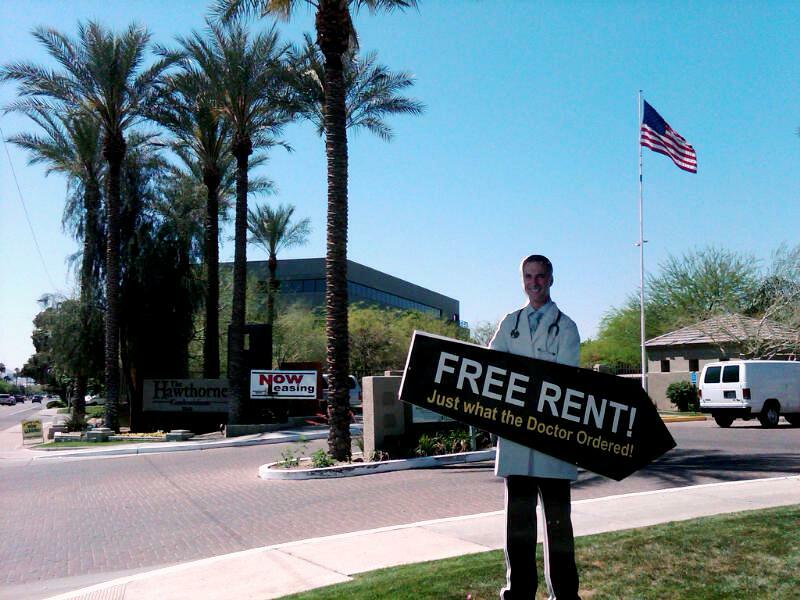 I will venture a prediction that within a year many of these places could possibly have lots of tenants, as it is well known that many people in the surrounding areas of Phoenix have stopped paying their mortgages, way beyond normal foreclosure action and banks have not taken action for whatever reason. It is unlikely that will last as banks are slowly beginning to take action. It is simple economics of entry into what I see as a "Lost Decade" of stagnant economic activity. People who live in outlying areas, if they are employed, are likely to work in Phoenix and will not only be forced out of their homes but also unable to afford the future high cost of gas to commute. These complexes, in need of any kind of tenant and income to keep their properties out of foreclosure, will begin to rent to people moving in from the suburbs to be closer to work, regardless of credit history. In that sense it is economically logical and viable, filling the needs of both these property owners and the people who need affordable housing to raise the occupancy in any feasible way. The social and political implications of this economic arrangement are yet to be determined. To read an interesting story written as the condo-conversion market was winding down, published in The Arizona Republic on June 16, 2006, see "Apartments turned into condos now a tough sell" written by Glen Creno and contributed to by Catherine Reagor. This complex is mentioned in the story.